Windward and Leeward Islands: Post-Storm Caribbean Redirect: Far from being light-hearted bikini babes drinking painkillers on the beach, Irma and Maria have shown just how fragile and harsh life in paradise can be. For cruisers heading south, these storms have raised heavy questions—not about rebuilding their homes, communities, and economies as islanders are facing—but about how to help the hard-struck communities they have grown to love and whether going south this winter is an imposition on island communities in the aftermath of hurricane season or still a mutually viable option. Cruisers seem to fall into a few camps: some are opting for an altogether different winter—say one spent land yachting or along warm stretches of the Intracoastal Waterway. Some are looking at ways to help on the ground and contribute to the rebuilding of the islands most affected by the hurricanes. Still others are changing course to islands less affected by hurricane wrath. Destinations include the northern Bahamas, the Western Caribbean, and Leeward and Windward Islands not strongly impacted by the hurricanes such as Antigua, Nevis, and Martinique and islands south. While thinking about where and why cruisers are going this season, an 1897 copy of the “West Indies Directory of the Caribee Islands and North Coast of South America” by James Imray and Son fell into my hands. Reading descriptions from more than a century ago tells the tale of the resilience and changeability of the islands. Imray notes the islands are “subject to hurricanes, which occasionally do considerable mischief.” So with great humility towards the forces of nature, a nod to the past, and hope for the rebuilding already underway, here are some thoughts on a snowbird winter in the Windwards and Leewards in 2018. Cruisers today mention many of the same characteristics. 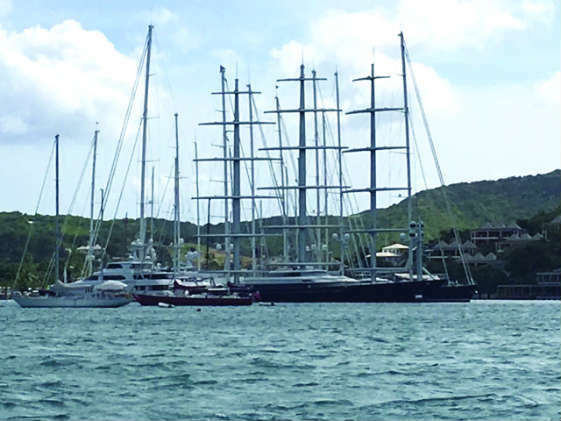 Antigua makes a popular stop for provisioning and obtaining boat supplies, hosts hundreds of transients each season, and is home to a large fleet of sailing superyachts. Popular anchorages include Falmouth Harbour and English Harbour, which are separated by a narrow isthmus of land. This year, Antigua may greet a few more sailors than usual. 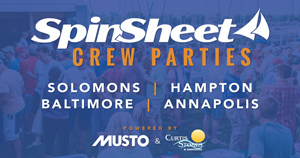 In the aftermath of Hurricane Irma, the Salty Dawg Rally has relocated the destination of its annual fall rally to the Caribbean from the Bitter End Yacht Club in the British Virgin Islands to Falmouth Harbour. Onshore near English Harbour is Nelson’s Dockyard National Park, which was completed in 1745 and served as England’s main naval station in the Lesser Antilles. 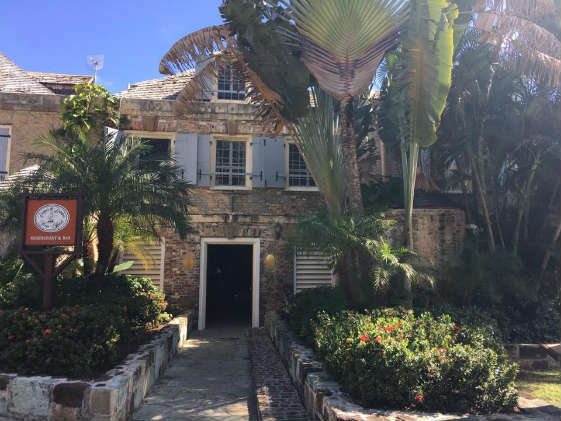 Visitors may enjoy learning about the history of Antigua and the naval base at the museum. Several beautiful hikes leave from English Harbour with the hike to Shirley Heights offering notable views over English and Falmouth Harbours. After the hike up to Shirley Heights, a footpath leads down to Pigeon Beach. Nevis holds many attractions: beautiful cloud-covered Nevis Peak, mooring fields off of sandy beaches on the western side of the island, quaint Charlestown (capital city and birthplace of Alexander Hamilton), friendly locals, and amazing hikes into the cloud forest. Even today, Nevis Peak peeks out from the clouds only on the clearest days. Hiking up and around Nevis Peak offers fantastic scenery and a quick change in habitat. 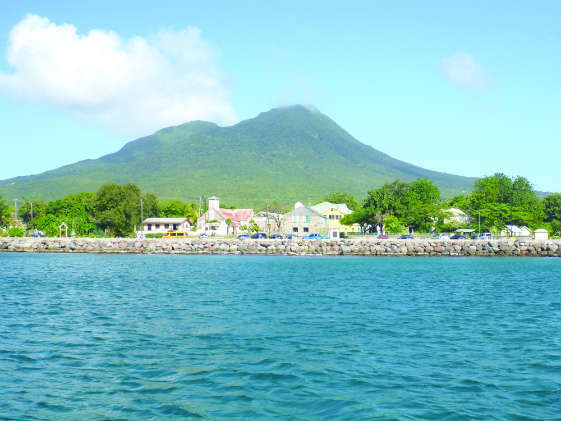 Public buses on the island take passengers to the Golden Rock Inn, the site of a former sugar plantation and trailhead for a hike to the “Source,” a water source on the slopes of Nevis Peak that has been mentioned on charts of the island dating back to the 1600s. The “Source” trail starts out deceptively easy: wide, flat, and slightly uphill. Donkeys and vervet monkeys share the trail while local farms and houses dot the side of the road. As the trail progresses, however, the jungle and the air slowly thicken. Then, all at once and without warning, the character of the hike changes, and slight inclines are replaced by a narrow ledge and sharply receding cliff. A further hike up mossy steps leads to the trail’s end: a 100-foot high, rusty, well-used ladder in which a few rungs have disappeared into the ever-after. Martinique lures with its French charm, solid infrastructure, and seemingly peaceful landscape. 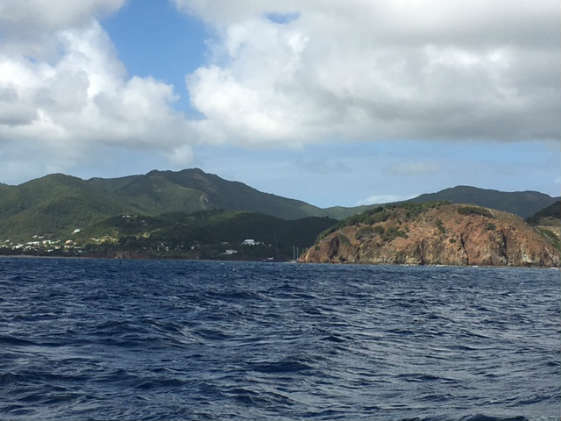 From the anchorage outside of St. Pierre on the northwest side of the island, Mount Pelée looms onshore, green and lush in its slumber. Earthly unrest culminated in the eruption of Mount Pelée in 1902. At the time, St. Pierre, known as the Paris of the Caribbean, boomed with a population of 30,000. All that changed on May 8, 1902, when Mount Pelée boomed louder, with a giant fireball of superheated gas incinerating the city below. Only two people survived. Some ruins remain to remind one of the disaster today: several shipwrecks are marked in the harbor; new buildings incorporate lone surviving walls into their structure, and a museum tells the story of the eruption. Several hikes invite visitors to explore the landscape near St. Pierre, including a hike up Mount Pelée. 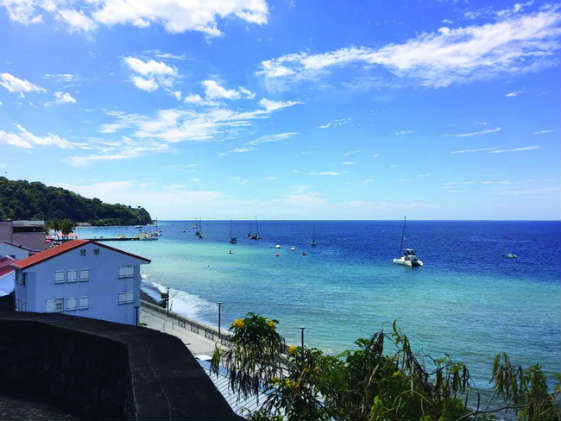 For those who prefer to take in a different type of island spirit, tours of the islands’ ten rum distilleries may be in order. Imray noted more than a century ago that “extensive central factories for the manufacture of sugar and rum have been established at various places on the shores of the island.” Some of the distilleries date back as far as 1765; all offer distinctive rhum agricole, and many can be visited as part of a La Route des Rhums tour in Martinique. noonsite.com: “The global site for cruising sailors” has updated reports on current conditions at destinations throughout the world, including islands impacted by hurricanes. “The Cruising Guide to the Northern Leeward Islands” and “The Cruising Guide to the Southern Leeward Islands” by Chris Doyle. “The 2017-2018 Sailors Guide to the Windward Islands” by Chris Doyle. For inland hiking: “Ready to Get Wet? (Top 10 Hikes in the Caribbean)” by Michael Sweeney. Download James Imray’s “West Indies Directory of the Caribee Islands and North Coast of South America” on Google books.